It’s a pleasure to be writing one of the inaugural blogs for the aptly-named WasteNott campaign for this year, as your Students’ Union Environmental and Social Justice Officer. As an Environmental Science student, sustainability has always been a passion of mine, but I hope I can persuade you that this is not a passing fad but something we all need to get involved in. As I said in my acceptance speech (after a campaign involving 0 leaflets! ), it’s our future at stake. 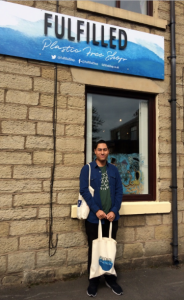 A few weeks ago I went to the opening of the first ever zero-waste plastic free shop in Greater Manchester where I live. I hope to see a similar initiative in Nottingham one day! Last year across the UK we used 1.1 billion plastic bags. Over 3 million tonnes of plastic in total, including 13 billion bottles, the majority of which people did not recycle. Over 2.5 billion coffee cups were used, with 99% of them not being recycled. And most shockingly, at a time when people are starving across the world, we threw away 4 million tonnes of food, equivalent to £470 per household in the UK. Most of this is incinerated, or sent to landfill where it will remain for longer than our lifetime, while food waste in landfill produces methane, a greenhouse gas 30 times more potent than carbon dioxide. The best thing we can do is reduce what we consume in the first place. Single-use plastic is one big thing we need to reduce. At first it all seemed like a good idea, cheap, light, hygienic, convenient. But first the oil had to be extracted, refined, formed into cups, forks, or whatever, transported halfway across the world and used for a matter of minutes before coming to the end of its life: burning, burial or on the pavement and into your nearest river. Changing our mentality to recognise the resources these are and not just waste might not be easy at first but every little helps, whether it’s bringing your own shopping bag, lunchbox and cutlery. Small steps lead to big change. These are made of paper (requiring an estimated 6 billion trees for the US industry alone) but laminated to stop them leaking, making them almost impossible to recycle. In the UK there are only 3 plants that can process them, so it’s not economical or eco-friendly to separate and send them there. So the best thing we can do is not use them in the first place and bring our own mug, something that we at the SU will be incentivising this year. If, like me you have at least one coffee a day, that means 300+ a year so it all adds up! When it comes to food, around half of what is produced is wasted before it gets to the shop, due to unscrupulous rules and regulations, often on appearance. The rest is thrown by the shop or by us because we buy too much and can’t eat it all. The budget-conscious student might be tempted by BOGOF deals but next time just think ‘Can I really finish this?’. Relying on ‘best before’ dates is another problem, as they don’t actually indicate food safety. It’s Use-By dates that matter. Even so, use your senses before you throw. As for eggs, you may know the trick to put them in water – if it sinks, it’s alright! Be creative with your leftovers, check out the ‘Lovefoodhatewaste’ website for tips and recipes. It’s not easy to live a zero-waste life, so what we use we must recycle. Many of us already do but some wonder what the point is of all this sorting and segregating. It’s to ensure these products can have a future life to be made into new things. Fortunately, in Nottingham, it couldn’t be easier. If you live in the city all your plastic bottles, cans, paper, card and glass can go in your brown-grey bin together (without bags). On campus, please keep your glass separate, but you can bag the recycling and recycle most plastics. We will do the rest. Currently Nottingham City is behind in recycling, at 30%, compared to our neighbours Broxtowe (which includes Beeston, at 40%) and Rushcliffe (which includes West Bridgford, at 50%), so we all need to do our bit. Try it. Keep a separate container next to your bin and you’ll find the majority of stuff can be recycled. Plastic bottles aren’t all that bad if you recycle them, but it’s even better to remove the bottles from the equation, and bring your own to one of the many more water fountains we hope to have in place next year, saving you money as well! 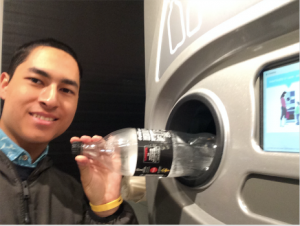 I was on a field trip in Sweden, where they have a bottle deposit scheme. As a result, recycling levels are through the roof and you won’t find any litter either. It would be nice if we could see such a system here in the near future. Often it’s easy to be attracted by headlines of companies doing one thing for a green ‘image’, such as banning straws (while giving out plastic cups), or switching from bottles to cans or biodegradable cutlery. But it’s no use if said cans are still landfilled and the cutlery isn’t composted. It’s about the bigger picture, treating waste as a resource and changing behaviour in everything we use. If you’re really keen or want to learn more, there have been many programmes that put it into perspective. The BBC recently aired the fascinating ‘The Secret Life of Landfill’ (still on iPlayer), and a few years ago the chef Hugh Fearnley-Whittingstall came to my town to launch his own Waste Not campaign in his programme, Hugh’s War on Waste. I’m keen to hear your stories and suggestions on how we can make University life more sustainable and am happy to meet up with anyone who’s interested. Get in touch at suenvironment@nottingham.ac.uk, and follow me on Twitter @UoNSU_ESJ or find me on Facebook to keep up to date with our campaigns and competitions for this year. Plastic Free Pantry is a great Notts based social enterprise that sells food, coffee and other products online without plastic packaging and ships to all over the UK (by a courier that offsets their carbon emissions). You can collect from their premises in Daybrook and they’re planning on having open days too for people to take in their own containers to be filled!